All electroplating and metal finishing facilities that discharge process wastewater to a POTW are subject to some monitoring, reporting, and recordkeeping requirements. The exact nature of these requirements are determined by your local POTW. In all cases, contact your Control Authority to determine your specific requirements. Industrial users are required to obtain a permit before discharging < process wastewater to a POTW. The permits are issued by the POTW itself and typically must be renewed every three to five years. The permits will usually contain discharge limitations and standards, and monitoring, reporting and recording requirements. Typically, the permits incorporate any requirements of categorical standards, if they apply to the facility. All industrial users subject to Categorical Pretreatment Standards, such as electroplaters and metal finishers, must submit a baseline monitoring report (BMR) to the Control Authority. The purpose of the BMR is to provide information to the Control Authority to document the industrial users current compliance status with a Categorical Pretreatment Standard. The Control Authority is defined as the POTW if it has an approved pretreatment program, otherwise the BMR will be submitted to the State (if the State has an approved State Pretreatment Program) or to the EPA Region. Additional information on Baseline Monitoring Reports. What additional operation and maintenance and/or pretreatment is necessary to achieve compliance. See section 40 CFR 403.12(d) of the General Pretreatment Regulations. A certification that these methods conformed to those methods outlined in the regulations. Sampling and analysis procedures are found in 40 CFR Part 136. See section 40 CFR 403.12(e) of the General Pretreatment Regulations. 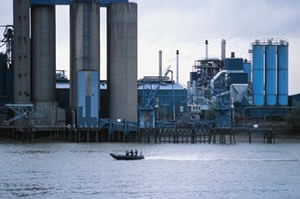 All industrial users are required to notify the POTW immediately of any slug loading (i.e., discharge of concentrated waste) of any pollutant, including organic and inorganic wastes, is released to the POTW system at a flow rate and/or pollutant concentration which will cause interference with the POTW. See section 40 CFR 403.12(f) of the General Pretreatment Regulations. Any industrial user subject to the reporting requirements of the General Pretreatment Regulations must maintain records of all information resulting from any monitoring activities required by 403.12 for a minimum of three years. These records must be available for inspection and copying by the Control Authority. See section 40 CFR 403.12(n) of the General Pretreatment Regulations. The information contained in this site is provided for your review and convenience. It is not intended to provide legal advice with respect to any federal, state, or local regulation. You should consult with legal counsel and appropriate authorities before interpreting any regulations or undertaking any specific course of action. that are different and/or more stringent than the federal regulations. Therefore, to assure full compliance, you should investigate and comply with all applicable federal, state and local regulations.